Well, it’s already a week ago, but I’ve had so much else to write about, I haven’t had time to tell you all about Bhai Tikka! The Tihar festival was really fun – it’s a festival of lights, and is a bit like Halloween, Bonfire Night and Christmas rolled into one. There’s loads of firecrackers, bangers and fireworks constantly going off, and it’s really crisp and cold at night now too. Everyone has fairy lights on their houses and shops, which gives it a nice Christmassy feel, and the kids go round people’s houses singing songs and people give them food or money and sweets – a bit like trick-or-treating or carolling. We made sel, (deep-fried sweet dough rings), although they don’t quite taste like donuts at all! Aamaa prepared special plates of food for all the kids – each plate had an apple, banana, packet of biscuits, a curried egg, some sweets and nuts and coconut, and a donut-thing. 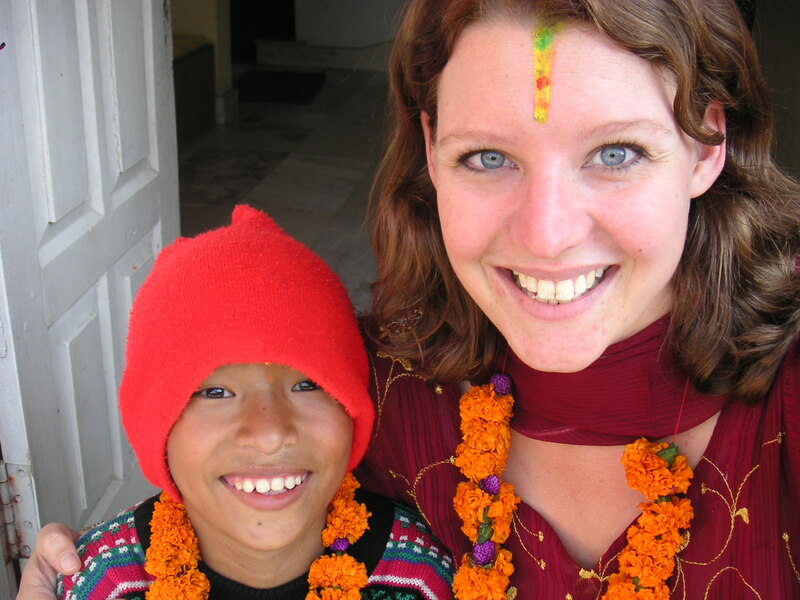 Then on Sunday, it was Bhai Tikka – bhai means younger brother, and it’s the festival of brothers and sisters. Tikka is the red powder you put on your forehead, but on bhai tikka it’s much more than that! There’s a complicated religious ritual that has to be performed by sisters for brothers and vice versa, and which I had to do too! Priya, as she rather bluntly put it, was menstruating and therefore isn’t allowed to participate in any religious ceromonies, so I had to stand in as Anil’s sister. First I had to walk around the room three times sprinkling the holy water on the floor, while Anil and his cousin sat in the middle in front of the shrine type thing. Then I had to go around again three times with oil, using leaves to touch the floor at intervals with the oil. Then I had to “annoint” both the men with the oil by touching them each three times on the head with the leaves. Then it was time to apply the tikka, but instead of putting a splodge of red tikka on their heads you have to draw a straight line down the middle of their foreheads with yellow tikka (made into a paste). 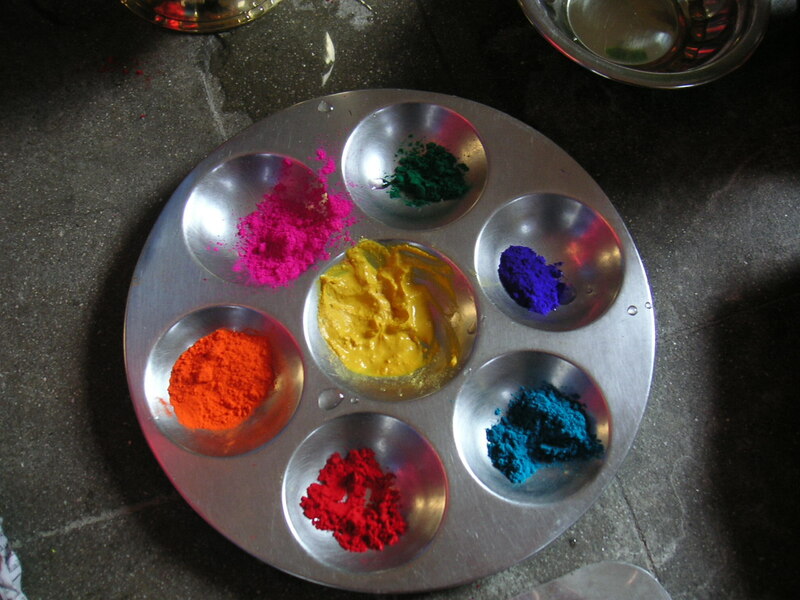 Then you apply dots of coloured tikka in a line on top of the yellow – seven colours altogether (I think they represent the chukkra colours or something). 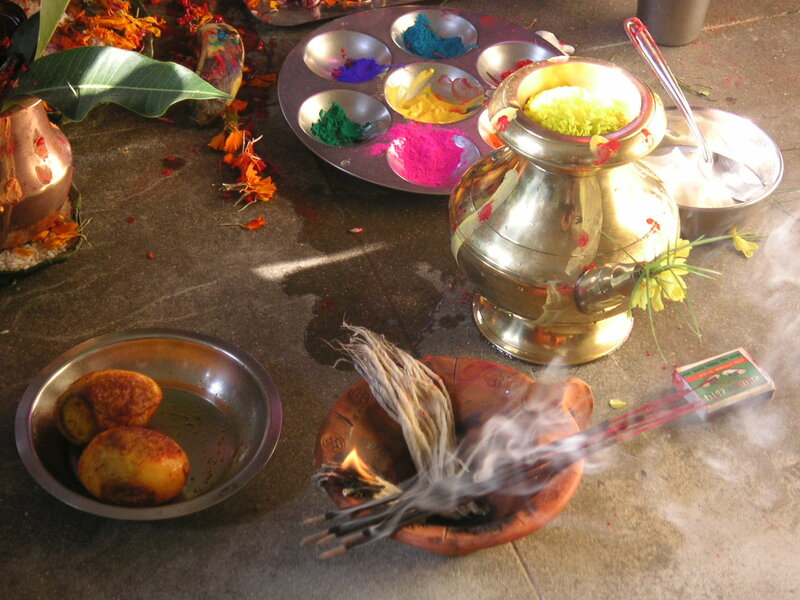 I had done alright with the holy water and oil part, but to put the tikka on I had to squat down in front of Anil and balance the plate on my knee (all the coloured powders were in careful little separate piles on the plate). I needed a cotton bud to apply the tikka properly, but had to reach over to get it, and, rather predictably, lost my balance and dropped the tikka plate. The powder went all over the floor, and all over Anil’s feet, and I was absolutely horrified! Trust me to screw up the important religious ritual by being clumsy and uncoordinated! The tikka was now useless, as aside from being on the floor, all the colours were mixed up too! I really can’t tell you how bad I felt about it all, but luckily there was another plate that Aamaa had let the kids use, so I used that instead. Anil was really nice about it, and claimed he didn’t mind being covered in tikka at all! I was a bit shaky after that, but managed to get the tikka done properly in the end! 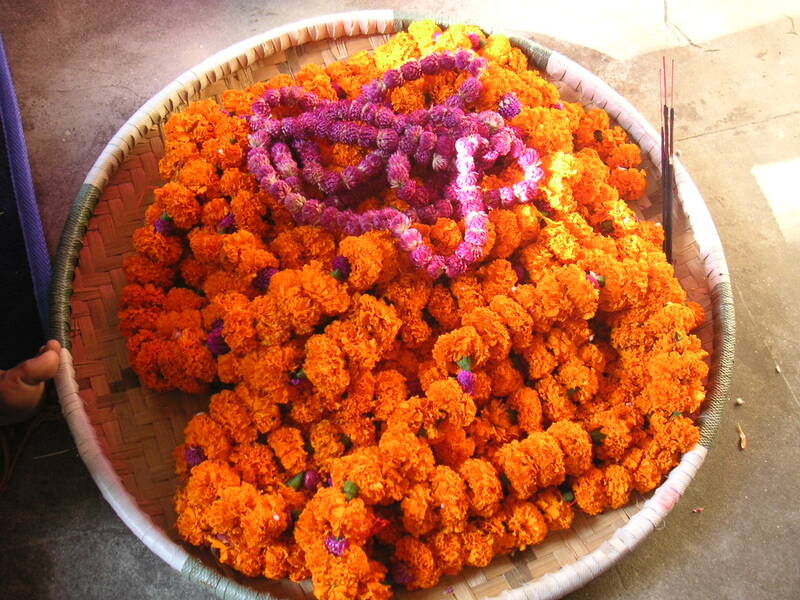 After that the boys did my tikka, and we exchanged plates of food and I gave them both wreaths made of flowers. Sheepish after spilling all the tikka everywhere! One of the houses we went to had loads of families living there, and they put out a platter of money, rice and sel for us while we sang and danced, but when they saw me they all got terribly excited and begged me to dance for them. I was a bit embarrassed, but the kids were pleading with me to do it, as apparently the crowd had said they’d give more money if I danced. I agreed in the end, but felt very weird, as they all made a circle around me and I had to dance by myself in the middle while the kids sang around me – definitely felt like a bit of a lemon! I got quite hot too, as although it was a cold night, dancing about works up quite a sweat. However, I felt (perhaps unnecessarily) embarrassed about taking my coat off – despite having so many layers on, the fact that I was already dancing in front of strangers for money made it seem a tad sleazy to start stripping off layers! 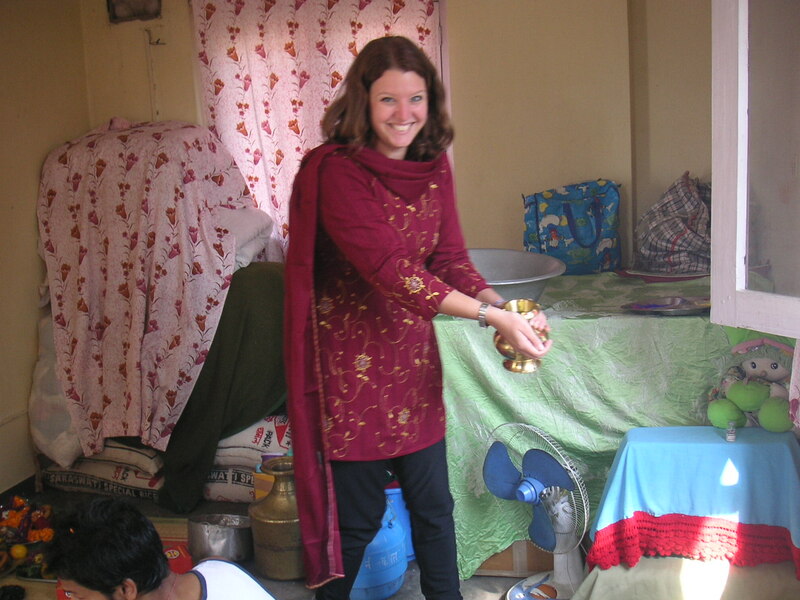 However it was all innocent fun, and the kids were thrilled – we made 300 rupees from that house alone, although after that I said firmly that I’d sing but didn’t fancy any more dancing! Everything else here is tootling along quietly, I met a whole bunch of new volunteers on Friday and we all went out in a big group, which was really nice. I’ve gotten so used it just being me and Alan out on a Friday so it was nice to meet more people and have a big night out. I must say that the level of poverty here still affects me quite a lot sometimes. I’ve gotten used to it for the most part, and particularly in Thamel, the tourist district, you get constantly besieged by beggars on all sides. There are a lot of very badly disfigured and disabled people who crawl after you on their hands and (in one case) knee, hands out imploring you for money. It’s really sad but I simply can’t give money to all of them, so I find it easier not to give to any of them. Then there are the groups of kids, from about 8 or 9 to 12ish, who loiter around shops. They’re clever enough not to ask for money, but beg people going into a shop to buy them some food (bread or biscuits etc). So inevitably some tourist will happily agree, thinking they’re feeding some homeless boys, and walk off feeling good about themselves, but as soon as they’ve gone (I’ve watched this happen) the boys will return the biscuits, get the cash, and go and buy glue with it.You can see these groups of kids all breathing heavily into paper bags which they put the glue into, and it’s awful to watch. Then there are the ladies with babies, who I personally hate the most. They are the most aggressive by far, and come after you tugging your clothes and insisting they don’t want money, only milk for their babies. The poor babies vary in age, but get dragged around like that all day. Furthermore the women won’t accept fresh milk, which is cheap and healthy, they want the expensive powdered milk, which again, once you’ve safely disappeared they return it and take the money. I think they make a fairly healthy living off pitying tourists, and obviously most people are only here for a short time and don’t realise what they’re really doing. I really truly DESPISE the way they use their kids like that, especially knowing that the kid isn’t going to get any milk out of it. Alan made a very astute point the other day, that if you’re out in Thamel at night, you soon see who really needs help and who doesn’t, because as soon as it gets dark and cold, all the women with babies disappear, as well as (interestingly) the disabled men who crawl around after you. They clearly have somewhere better to go, and while some of them may still be homeless, they obviously have a warmer and safer place to be at night. However the few stragglers left over are the ones who really are at the very bottom. Last Friday we all had a lovely big meal at a nice restaurant, and then moved on to our favourite bar, the Full Moon, for some cocktails. It was about 9.30, and already bloody cold, so most of the beggars had disappeared. We walked past a woman sitting on the street, with two children under the age of 5 sleeping wrapped in a filthy shawl, and she herself was only wearing a thin cotton shirt. I went to buy some biscuits for her (I always open the packets now so they can’t be returned), wishing there was somewhere I could get a hot drink to take away for her, cos it was really freezing (well, not literally, but probably only about 5 degrees or so) but sadly there’s no such thing here – not even a Starbucks! I gave her the biscuits, and she thanked me, but I couldn’t get the image out of my mind. To have two young kids out on the street like that in this weather is so awful. I really couldn’t enjoy my cocktail thinking about it, so I went back out and started looking for a shop where I could buy her a blanket or something. Almost everything was closed, but I found a pashmina shop and got her a cheap pashmina to wrap herself in instead, and gave her 1000 rupees. It’s only about 7.50 in pounds, but I know it’ll go a long way, and unlike some of the other beggars in Thamel, I felt like she really needed it. I just felt so guilty – if I can afford to spend 15 quid on my night out then I can afford to give her that, and it’s really hard to sit in a warm bar and enjoy your cocktail knowing there’s two babies and their mother outside in the cold with nothing. So, although I’m used to the poverty here for the most part, there are still times when it gets too much, and I think the colder weather makes it even worse. Next time I go out on the town, I’m going to the market first and stocking up on woolly hats and socks for those poor people! Speaking of socks (I know this email’s long, but it’s a funny story), I bought all the kids socks on Wednesday, because of the colder weather and the fact that they’re all running around barefoot in winter. (I don’t know about your mothers, but mine was always very clear on the benefits of socks in cold weather!). They all tried them on with glee and shouted “Maya! They fit!” with lovely happy faces. And then they carefully took the socks off, folded them up and replaced them back in the plastic. The kids all smiled and patted me gently, (and rather patronisingly) and promised they’d wear them tomorrow. But it’s sunny and warm during the day and freezing at night – that was the whole point of getting the socks! In the end I had to confiscate all the plastic wrappers, but then the kids just put them in their pockets instead! (although they did wear them the next day, so it’s a start!). hope you’re all well and happy and wearing socks!